Dangal has collected Rs 64.60 crores in two days. Aamir Khan film collected Rs 34.82 cr on the second day, making film inching closer towards Rs 100-crore mark. Trade Analyst Taran Adarsh shared, “ Dangal is Unstoppable… Does EXTRAORDINARY Business on Day 2… Fri 29.78 cr, Sat 34.82 cr. Total: 64.60 cr. [incl Tamil and Telugu].”The film is also doing well in the overseas market. Dangal collected Rs 28.49 crores from overseas market. Aamir Khan as Mahavir Singh Phogat, who taught wrestling to his daughters Geeta Phogat and Babita Kumari. The former is India's first female wrestler to win at the 2010 Commonwealth Games, where she won the gold medal (55 kg). Her sister Babita Kumari won the silver (51 kg) Dangal is the Hindi term for a wrestling competition film. 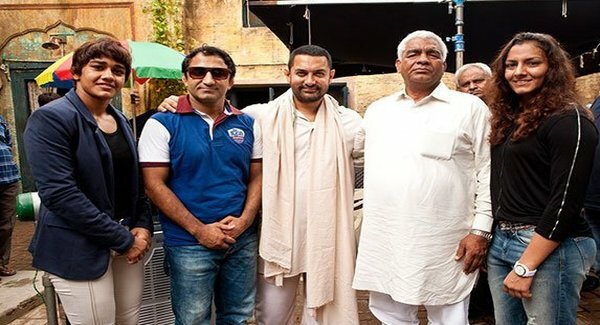 A coach with the Indian women's wrestling team, trained Aamir Khan and the entire crew for the wrestling sequences.Dangal released worldwide on 23 December 2016 Dangal is an Indian crime thriller film of 2016, directed by Nitesh Tiwari and produced by Aamir Khan, Kiran Rao, Siddharth Roy Kapur.